A name meaning 'forest of beeches', whose red-golden autumn leaves were lamented by Treebeard the Ent. 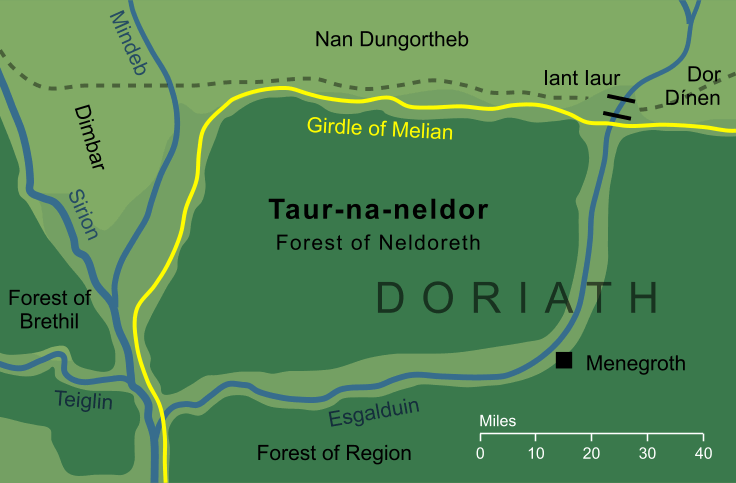 Better known as Neldoreth, this forest was part of Thingol's realm of Doriath in the heart of Beleriand. Taur-na-neldor was destroyed at the end of the First Age, and so for Treebeard to remember it at the end of the Third, his memory must have reached back across more than six thousand years. In Elvish, neldor literally means 'three-tree' or 'triple-tree', originally referring to the immense triple-trunked beech Hírilorn that grew in Taur-na-Neldor close to Menegroth. From this famous tree, neldor was adopted as the general Elvish word for a beech-tree, hence the translation 'forest of beeches'.